Model 910 Carbon Steel (CS) body and bonnet with Stainless Steel (SS) trim. Model 911 All SS construction. Model 916 Same as model 910 resilient seat/seals. Superior "leak-free" performance. Model 917 Same as model 911 except resilient seat/seals. Superior "leak-free" performance. Model 920 Steel body and bonnet with screwed cap and stainless steel spring for organic fluid vaporizers (ASME Section I - "V" Special Use or application). Model 921 Steel body and bonnet with plain lift lever and stainless steel spring for forced flow steam generators (ASME Section I - "V" Special Use or application). Model 927 Steel body and bonnet with packed lift lever and SS spring for high temperature/pressure hot water boilers (ASME Section I - "V" Special Use or application). Warn ring offers easy adjustability. Pivoting disc design offers exceptional seat alignment. Valve bodies are heavy duty casting. Note: 1. 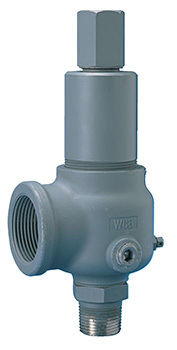 Back pressure increases set pressure on a one to one basis, and reduces capacity. Back pressure in excess of 10% of set pressure is not recommended.